The new chapter of Gucci Guilty signature fragrances revels in the notion of women who are truly liberated. A modern declaration of self-expression and fearlessness burns brightly in the new powerful statement #ForeverGuilty. 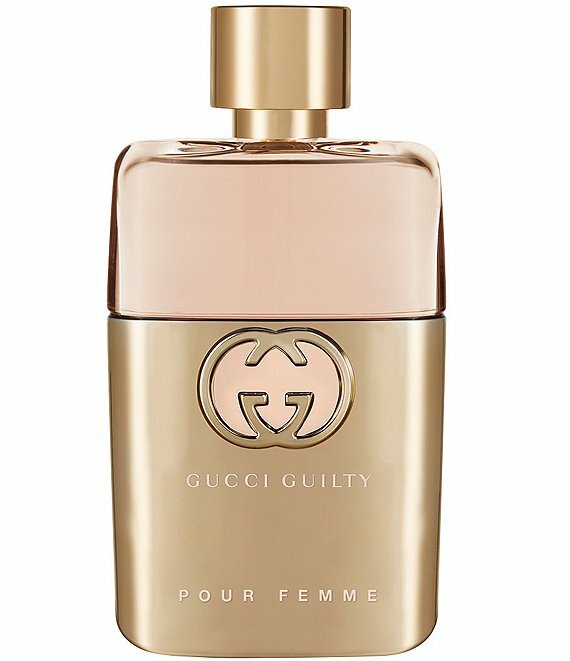 Blended for the new revolution, the Gucci Guilty pour femme scent is reborn, an Oriental Floral that brings richness and nobility to the original eau de toilette. Superior floral notes and enhanced natural fragrances flourish into a strong and refined Eau de Parfum. The perfume is intensified, with a higher perfume concentrated than the classic eau de toilette, radiating with commanding ingredients Mandora, Pink Pepper, Lilac and Patchouli. Opening in the mood of the scent's message, a top note experience is redolent with the citrus notes of Mandoraa fruit found in the Mediterranean island of Cyprus smoothed out with natural Bergamot and Pink Pepper. The heart defines the scent's new complexity. Lilac is contrasted with rosy and violet notes and layered with Geranium Oil to create a nuanced and individual floral blend. a deep natural duet of Patchouli Oils; Patchouli Coeur and Patchouli oil Micro-Distillation combined with Ambery notes, which leave enduring silagethe time the perfume's fragrance lingers in the air when worn.